So as many of you are undoubtedly aware, for the past year or so (okay, okay, it’s been exactly 380 days according to my nerdy detailed spreadsheet), I have been trying to find $100 in coins. Well, actually it started out being just coins but I expanded it to just any found money. 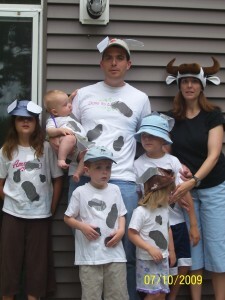 I went into today at $97.76 and then the fam headed to the mall for Cow Appreciation Day. i.e. 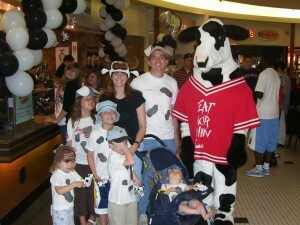 dress up like a cow and get free Chick-fil-A. Immediately when we got there, we checked the racecar strollers. This has been a good source of coins – at the mall they have these racecar strollers that you can rent for $5. When you return them, you get 4 quarters back. But sometimes people don’t return them, or they don’t put them back in the dock right, or sometimes they try to return them but the bank of places to turn them in is full. So we tested the strollers near the food court and boom – one of them came right out – it hadn’t been returned correctly, so we were up to $98.76. Then it was off to Chick-Fil-A. We ordered 4 #1 meals and 3 #3s – all free! The manager came out and wanted to take our picture with the cow. We were snapping pictures too – you can see more on FB. We found 2 dimes and a bunch of pennies at the mall that put us up over $99 and I started thinking about how if I had a good day tomorrow that I might hit $100. We were really trying to find a nickel for the 2nd straight day of coin cycle but couldn’t find one. Then, as we were leaving, we spotted a family with a racecar stroller that was heading towards the Miller Family play area (i.e. where Nordstrom is under construction). We had previously noted that the bank that is located by the exit there was full, so we thought that might bear watching. Instead, they turned to go out another exit and left the mall with their stroller. We “discreetly” followed them. They got into their car and just left the stroller in the parking garage. After a bit of loitering as we waited for them to drive away, we pounced on the stroller and took it back into the mall. We headed down and returned it. 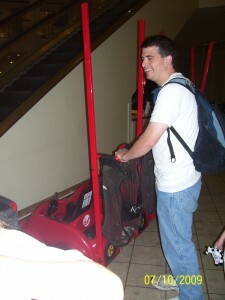 Here’s me returning the stroller that put us up over $100. And here’s the final 4 quarters that did it. So now what? I’m not sure – I still plan on trying to find coins and other money but I’m not sure what to set as my next goal. Maybe I’ll try to hit $200 by the end of the year? Yup, I was outhustled yesterday afternoon. I had stopped to get some gas, and after filling up, I did my normal jaunt around the pumps, checking for coins. I went one way, and then I was coming back to my car when I spotted a nickel and a penny on the ground. But so too did an old guy coming out of the building and heading to his car. And he was closer, so he bent down (without throwing out his back) and scooped em up. Oh well…. But nevertheless I was not daunted, and went on to hit the coin cycle yesterday, my 2nd in 3 days! And with the $3.15 in coins I found on Saturday, I am now up to $96.12. I am on pace to hit $100 on the 22nd – 15 more days! I tried to save the environment! #1. To the library to return the book on CD I got when I visited all 67 counties in Alabama in 22 hours. I’ve had this book on CD sitting on my desk at work for a month or so. So I got almost to the library and realized…. the book is STILL sitting on my desk. Grr! #2. To a guy’s apartment to buy a Nintendo 64 off of Craigslist. I’ve moved past exploiting inefficiencies in the secondary BTFE market and instead have moved on to the used N64 market. Looking for people on Craigslist mostly that are just trying to get rid of the systems, not realizing that certain games sell for $10-20 each on eBay. I will post more about this later. This trip went well and I was able to get a console (with memory card! ), 2 controllers, 3 games (including Paper Mario which sells for $20 itself) for $20 total. #3. To a carpet outlet store. We have been cleaning up the new part of the basement to use as a play room. We were looking to get some carpet or a rug to lay down there. So I thought I would check these folks to see if they had any scraps that they would sell. We did get a bid on a 20×12 section for $140 or so, but I’m not sure if we want to spend even that much. Still, that was a successful trip. I knew it would be since as soon as I got out of my car in the parking lot, I looked down and found a penny! After I got home at the end of the day, I took S. with me to go to a different BMV which was open late, with my birth certificate and social security card. Massive problems finding it! I’m sure that all the gas I saved combining trips earlier in the day was wasted as I drove back and forth on this road trying to find the stupid BMV. I eventually did find it and got in with 3 minutes to spare till closing time. I waited my turn and filled out my paperwork. I was excited for a) no corrective lenses and b) dropping my weight from 195 to 180. I filled out the 180 part and then they processed it and gave me the sheet to review and kept the weight at 195. I pointed that out and the guy was like “Oh it’s okay – the state doesn’t care”. And I was like yeah but I do! I didn’t lose 20 pounds so my driver’s license can still say I’m a fattie! I didn’t say all that of course but I thought it! And even though they gave me the “Eat Death customer who comes in 3 minutes before close and causes hassle” look, I stood my ground and they re-did it. So I got that goin for me. And I suppose, if you were to pick a day to lose your driver’s license, the day before it expires is not a bad day to do it!!!! So – classic story that I want to share. We have recently been sick in our family, of the vomitous variety. As many of you undoubtedly know, one of the downsides of having multiple children is that they all get sick. And they don’t even have the consideration to all get sick at once. Nope, one gets sick, then they get better and get the next one sick, who in turn infects the next, etc. And sometimes by the time everyone’s done, we’ve caught something else. So yeah, recently several of our kids had gotten sick. Carolyn and I managed to avoid the illness, most likely becuase we do silly things like “Don’t drink out of the cups of people that are sick” and “Wash our hands” – you know, crazy wacky wild ideas like that. So I took the last remaining non-sickie to Cub Scouts and on the way back (after eating pizza and Gatorade), he tells me as we’re driving back “I don’t feel good”. I ask him if he’s going to throw up and he says yes. So we stop the car, get out, and he barfs all over the side of the road. On a side note, let me just tell you how refreshing it is to actually have some children that can throw up in the toilet. As opposed to, say, wherever they happen to be. I’d say we have 2 1/2 kids that can manage that right now. As a 2nd side note, if you’re walking around Hyde Park, I’d avoid Paxton Avenue, IYKWIM. So yeah we get back in the car and flee the scene before anyone comes out and notices us. He says he’s feeling better and you know how you get after you throw up – you feel a little better having cleared things up, so to speak. So I decide to continue on with our grocery shopping. In hindsight this was a clear “Dad” move. So we’re at Sam’s Club and we had just finished checking out and he again says that he’s not feeling good. So I’m like “Alright” and we start busting for the bathroom. Really it was a pretty convenient time – we had already checked out, and we were up at the front of the store near the bathrooms. So we were booking it – I’m pushing the cart and he’s right there with me. I get to the bathroom and stop to leave the cart and get him into the bathroom when I look back and notice he’s a few steps behind me. HE HAD STOPPED TO PICK UP A PENNY THAT WAS ON THE GROUND!!!!! This was a crucial delay and cost us – as he threw up in the foyer by the water fountains and then again at the entrance to the men’s room. So clearly I am doing a good job of teaching him the rules of coin picking up, I am not doing so great a job at teaching him the rules of vomit / bladder control. As anyone who has thrown up and/or nearly peed / pooed their pants knows, any delay can be crucial. And most importantly, once you feel it is “safe”, then your body just starts going. That’s why so many people have accidents right when they get to the bathroom but before you make it to the actual toilet (or get your pants down). You have spent so much time, effort, and mental concentration getting to the bathroom that once you make it, your mind is like “Ahhhh we’re safe now”. First of all apologies to those of you I’ve already told this story. But yes, I fear I may have been mistaken for a homeless person yesterday. I was out at the mall last night with my 2 older children. I had gone there to walk around because I was in a pedometer challenge (who could take the most steps from the 23rd to the 30th) and it was the last day and I wanted to do my best to help my team to win. And also to look for coins of course, as the mall is a great place for coins. So we were walking around the food court and we had spotted a few coins. We had stopped to get a drink at the water fountain in the corner of the food court when this girl (maybe 10-12 years old) says “Excuse me” to my son. 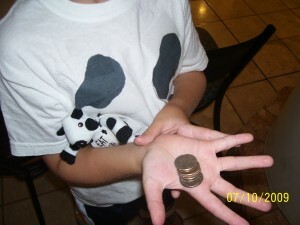 We stop and turn, and she gives him $1.17 in coins and then leaves. Now originally I just thought that her mom or whoever had seen him looking for coins and just wanted to make his day by giving him a bunch of coins. And I still think that’s a reasonable possibility. But then this morning Carolyn came up with the homeless hypothesis: that the mom or whoever saw us scrounging for coins and thought we were trying to come up with enough for a meal for the kids and thought she would help out. In any case, I have decided not to count that money in my change quest. I actually feel kind of bad about it, especially if she really was intending for it to help us out. So I am going to donate it at church on Sunday and that way it can go for some good. The weird thing is that we had just come from a (rare!) dinner out at Larosas. We had dressed all the kids up in the hopes that it would cause them to behave better than a typical kid at a restaurant scene. It worked, but that is neither here nor there. I bring it up because I was dressed in my work clothes. The son was dressed similarly in khakis and a button down shirt, and the daughter was in a nice dress. So it wasn’t like we were all lookin scruffy. But in other news, we did find $1.45 in just run of the mill coins (1 quarter, 9 dimes, 1 nickel and 25 pennies) and also found 3 of the racecar strollers that were not returned to their bases, which we returned for 4 quarters each. Total is now up to $32.44 found, with an estimated $100 date of Jan. 24, 2010. In other other news, we got killed in our challenge. One of the other teams both did 25,000 steps both yesterday and the day before and wasted us. So I’m a comparison shopper as you can probably imagine. I regularly go to 3 or 4 stores during the week. Since all of our grocery stores are within a mile or so, the dollars you can save by shopping at the places with the lowest prices on the various stuff are more than worth the pennies it takes in gas. So while I was out today I noticed some weirdness in the prices of milk. While I was out at Walmart earlier in the week, I noticed that milk was $2.48 a gallon, so I put that on the list to buy there. But when I went to buy it today, I saw that only Vitamin D and 2% were $2.48. 1% was like $2.69 and skim was $3.00! So that’s weird but not unheard of. But then a bit later when I was at Sam’s club, I noticed that skim was $2.62, with 1%, 2% and Vitamin D all progressively more. In other words – the complete opposite? That made no sense. I could believe it if you explained it to me that the extra fat in the 2% and Vitamin D made it more expensive. And I suppose I’d consider believing if you explained it to me that the extra fat came naturally and it cost more to take it out for the skim or 1%. BUT I’M CERTAINLY NOT GOING TO BELIEVE BOTH OF THOSE!!!!!!! In non-related news, while I was at Meijer, someone had left a $5 bill in the cash return of the self-scan machine. I waited for someone to come back and claim it but nobody did, so since there was nobody really to return it to, I kept it. Too bad that doesn’t count for the change race!